Woodblock print depicting the Empress Jingu and the Minister Takeuchi, from the Banners as Interior Decorations series. From the Banners as Interior Decorations series. 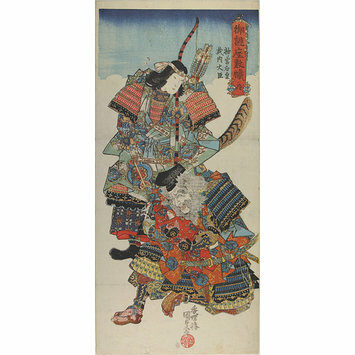 Woodblock print depicting the Empress Jingu and the Minister Takeuchi by Kunisada, Japan, 19th century.